In her day, in her field, Edith Clifford was a rock star. In a career spanning over 20 years, she toured the world playing to royalty, celebrities, and sold-out crowds; risked injury or even death with each performance; made a tidy little fortune; and then retired quietly to run a small-town grocery store. 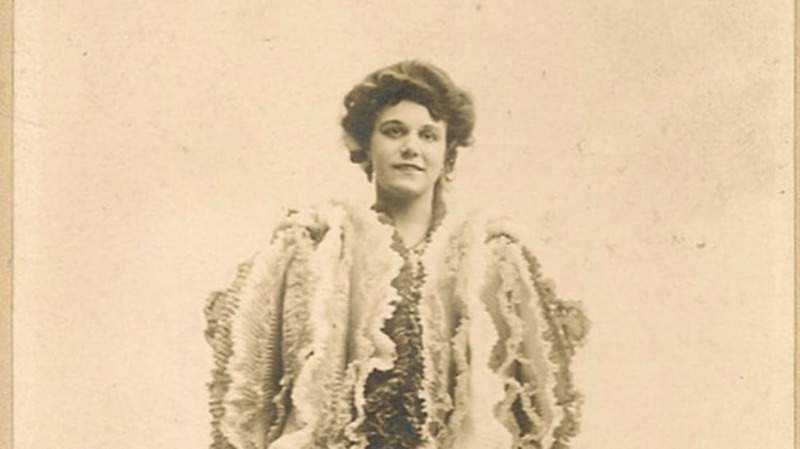 Mademoiselle Clifford, as she was billed, was one of history’s most notable sword swallowers—a star under the canvas of the big top and on the vaudeville stage. While she’s no longer a household name, her legacy endures to this day in her chosen discipline, where a select few are still attempting to meet or break her professional records. To give her rarity as a performer starting out in the late Victorian era some context: In the 21st century—when there are at least two professional schools teaching the secrets of sideshow performers—sword swallowing remains one of the world’s rarest performance skills, with fewer than 300 living practitioners currently working in the trade. Part of this rarity is due to the genuine danger and difficulty of learning, which is an exercise in dogged dedication, physical endurance, and mental acuity—all which are used to overcome the body’s own internal reflexes. Proving this is no mere magic trick or illusion, the Sword Swallowers’ Association International will only certify performers of legal age who have been properly trained to swallow a blade at least 16” long and ½” wide. Born to English parents in Boston, Mass., (although some contemporary accounts put her birthplace as London, England) in 1886, Mlle. Clifford reportedly began her career in 1899 after being trained by the veteran one-legged sword swallower Deln Ritz. She debuted with one of the Ringling Brothers’ touring shows at the tender age of 13. Her act would change and evolve over the years, but it eventually came to include swallowing razors, scissors, bayonets, curved blades, and up to 13 swords at once, with blades up to 26” long—and that was just the hors d’oeuvres. Her big finale went out with a literal bang, consisting of a full-length bayonet fired down her throat using a cannon. Even her personal life was dominated by the success of her career. She married twice—both times to other performers within her industry. Her first marriage was to a human oddity, an “elastic skin” man (who was likely born with a genetic condition called Ehlers-Danlos Syndrome that made his flesh stretchy) by the name of Jim Maurice (a.k.a James Morris), who took her name for the sake of the act, since she was the bigger box office draw and they hit the road as “the Cliffords.” After he passed away around 1911, she married Karl Bauer, a German-born trapeze artist, who grounded his own career to work as her assistant; they continued to tour for over a decade, again as the Cliffords onstage and the Bauers at home. After 23 years on the road, Mlle. Clifford retired quietly from show business in 1922, moving to Canton, Ohio, and running a local grocery store with her husband as the neighborly Mrs. Edith Bauer. She apparently never mentioned her life on the stage to her new neighbors, choosing instead to step out of the spotlight, focus on her family, and put her collections of well-loved and stage-used swords, saws, and bayonets away in a closet. And there they remained, largely forgotten after her death in 1942. At some point in the '50s there was a closet clean-out and garage sale, and a portion of the collection went to the neighbors, who also put them in storage and forgot about the prized blades. Decades passed and there was another sale, now on eBay. The lucky winner this time was Dan Meyer—the founder and head of Sword Swallowers Association International. After some research confirming his initial hunch, he was able to determine the swords were indeed Mlle. Clifford’s tools of the trade. Which, in a sense, brings the story full circle: The swords are now in the hands of a colleague and descendant of sorts, and right where Edith would want them to be—in front of an appreciative audience.